Here is a Special Link to 1995 Graduates Guestbook . . . Please join us for our GIHS Class of 1995 - 15 Year Icebreaker! Our mid way point between the 10 year and the dare I say.....20 year reunions! When: Friday, July 2, 2010 - 7pm - ??? If you are on facebook, please see the events tab for RSVP and details! Members of the Grand Island High School Class of 1995 got together for their 10th reunion ice breaker at the Brick Oven on Friday, July 1, 2005 and a social hour and dinner at River Oaks on Saturday, July 2. Photos are by classmate Dave Catherine. The Class of 1995 Reunion Committee included Nicole Benzing, Dave Catherine, Denise Caudill (Mulvena), Heather Holdaway, Robyn (Sciuk) Muehlbauer, Nicole Schiro, and Kim Thaler. 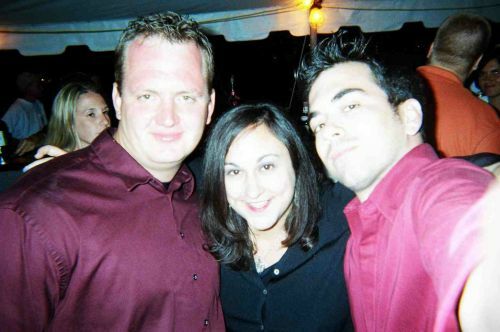  Friday July 1, 2005 - Icebreaker - Brick Oven (Old St. Angelo’s) 8 p.m.
Click "Class of 1995 Reunion Invitation" for all details on the July 2005 event. Grand Island High School Class of 1995 Missing Classmates List - Can You Help? The GIHS Class of 1995 Reunion Committee needs contacts for missing classmates. Click "Class of 1995 Missing Classmates" and contact a committee member if you have information on anyone. The GIHS Class of 1995 Reunion Committee (Nicole Benzing, Dave Catherine, Denise Caudill (Mulvena), Heather Holdaway, Robyn (Sciuk) Muehlbauer, Nicole Schiro, and Kim Thaler) is hoping everyone will assist with the reunion contact list. Classmates are asked to email giclassof1995@hotmail.com with ANYONE they have contact information on, including yourself (i.e. Physical home address, email address, and/or phone #'s). Even if you think the committee already has the information on particular people and yourself, PLEASE still send it to the committee. This will be a tremendous help!! If you would prefer, please feel free to call Nicole Benzing, 773-4848 or Robyn, 694-1598. For complete reunion information, click "Official Class of '95 Website". The Grand Island High School Class of 1995 will hold its ten-year reunion over the July 4th weekend, 2005. Events are still being firmed up but classmates are asked to save the weekend - Friday, July 1st through Monday, July 4th. For the official Class of 1995 reunion website, click http://gihs1995.homestead.com/. Contact people are Nikki Schiro, Kim Thaler, Heather Holdaway, David Catherine, Robyn (Sciuk) Muehlbauer and Nicole Benzing. Email notes and questions to giclassof1995@hotmail.com.